Unbeatable value for any party with a child under 11 years! This exceptional ticket is accepted at a huge range of restaurants around the International Drive, Kissimmee, Lake Buena Vista, Universal Orlando and Sandlake Road areas and includes a massive variety of eating options from budget to fine dining and everything in between. Choose from American, Italian, Mexican and Indian cuisine, Steakhouses and Seafood at family favourite restaurants such as Ponderosa, Sizzlers Restaurant, CiCi’s Pizza, McDonalds, El Patron Mexican Restaurant & Cantina, Philly's Best Cheesesteaks, Basking Robbins, Pacino’s Italian Restaurant, Curry Taste of India and many more. The Kids Eat FREE Card Plus is valid for children aged 11 and under (one card per child accompanied by a full paying adult) and must be presented at the time of ordering your meal. One free child meal will be offered per Kids Eat Free Card with the purchase of an adult meal or entree. Some restaurants also require you to purchase a drink and Kids Eat Free Meals may not apply to taxes, gratuities, bar drinks or take away food. The Kids Eat Free Card cannot be used in conjunction with any other offers or discounts. 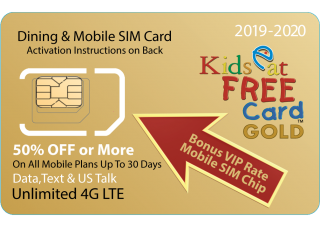 PLUS while stocks last, specially marked GOLD cards also include a universal SIM from SmartSIM USA powered by T-Mobile, offering unlimited blazing fast 4G data whilst in the USA, unlimited international texts, unlimited incoming international calls and outbound calls to US numbers for just $3.00 or less per day. Plans are sold separately and selected at time of activation request. There are a number of other benefits exclusively listed for GOLD Card holders, including extra percentage off at selected restaurants, and some GOLD-only venues on International Drive, the Disney area and Winter Park, where you can dine like a local. Gold Offers may change without notice. Kids receive a scoop of ice cream with any purchase! Kids receive a free donut with any purchase!